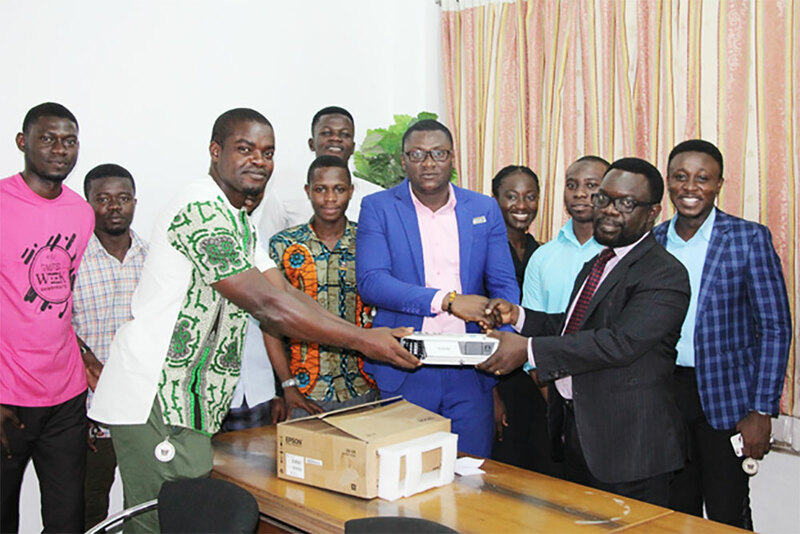 The Students’ Representative Council (SRC) of Kumasi Technical University has donated 35 projectors at the cost of GHS94, 500.00 to the University. The 2018/2019 SRC indicated that as part of the Council’s contribution to teaching and learning on campus, the body deems it appropriate to donate those equipment to enhance the delivery of lectures and learning processes. Speaking at the brief ceremony on Thursday, March 21st at the Executive Committee meeting, the President of SRC, Emmanuel Nana Danso mentioned that it was important for the Council to do such a thing since it would eventually inure to the advantage of students. The Dean of Students, Dr Ato Essuman, on his part advised that since the projectors will be used at the various faculties and departments, it is important that such user offices take good care of the equipment and ensure that they last long. He suggested that innovative ways must be found by those beneficiary offices to monitor the usage of the equipment. Receiving the equipment, the Interim Vice Chancellor of KsTU, Prof. Mike A. Acheampong thanked the SRC and gave the assurance that the machines will be put to good use so that the generality of the students benefit from them. Photo: Interim Vice Chancellor (in tie) shaking hands with the President of SRC while the Dean of student (left) supports them.